Our friends, Dannie and Bill, were here visiting us last week. I guess the drive from North Carolina last October was so lovely that they decided to make it an annual event. That's great news for us! They get to see some fall foliage, as they travel through the beautiful mountains of NC, and we get to see them! But wait, there's more! . . . They always arrive bearing gifts of some of our NC favorite foods. You know, the kind of stuff you miss when you move away from a place, because you can never find it anywhere else on the planet? Like a dozen cans of midget lima beans (USDA 28/64 inch in width or smaller!) from the Piggly Wiggly that I use to make my friend, Diana's, Best-In-The-World Eastern NC Brunswick Stew. And six frozen pounds of eastern NC barbecue (from each my three favorites - Wilber's, McCall's and Ken's), which just happens to be . . . The Best Barbecue In The World! And Scott's barbecue sauce, another eastern NC delicacy, which may not be the best way to describe barbecue sauce, but it really is in a class by itself. And last, but not least, Atkinson's Self-Rising White Cornmeal, water-ground goodness for the very best cornbread -- light with a crispy crust. Sure, they could ship these goodies to me on a regular basis, so I would never be without. But this is a truckload of stuff with some significant weight, and that would cost a small fortune -- a cost I would gladly bear, if I didn't have such good friends who were coming this way anyway. And that would deprive me of the pleasure of seeing their jolly faces come to my door with arms full of good things to eat! So, while they were here with us we ate, and ate, and ate. We always have new local places we want to share -- like Whisker Willy's biker bar for delicious barbecue ribs. And favorites they've discovered on previous trips -- Italian Village for pizza and Italian Beef and Honeybaker's for those amazing yeast rolls. 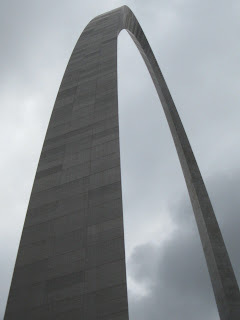 We even went to St. Louis to see The Arch and visit Grant and Kristen. 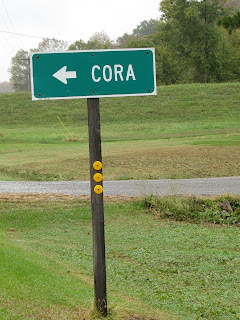 On the way up, we stopped in the little town of Cora, IL -- I know! 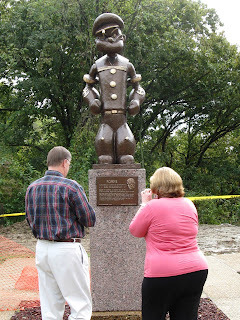 -- for a photo op, and then again in Chester, IL, home of the creator of Popeye. In Chester, we crossed the mighty Mississippi River and headed up its western banks to the tiny town of Kimmswick, MO, home of some cute little shops we didn't visit, because we were on a mission, if not a schedule. Instead, we headed straight to The Blue Owl Restaurant and Bakery for lunch. The Blue Owl and owner Mary Hostetter did not disappoint -- lunch was delicious and Dannie had Mary autograph copies of the cookbooks she bought to take home. 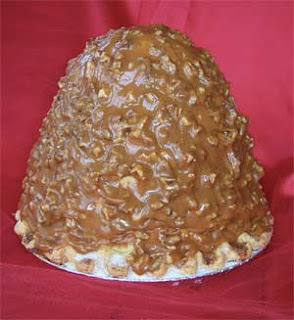 Check out this apple pie from The Blue Owl - it's a foot high! This picture is from The Blue Owl website, since I was so in awe, I forgot to take one. That night we had dinner with Grant and Kristen at Cunetto's House of Pasta on The Hill in St. Louis. I first heard about Cunetto's from a guy who owns a really great gift shop in Moultonborough, NH. He visits friends in St. Louis all the time and always heads to Cunetto's straight from the airport! When he found out I lived so close, relatively speaking, but had never eaten there, he was in shock. Now we've been, and I must say, we were unanimous in our verdict that the food is delicious, the portions are generous and the prices are unbelievable -- in a good way! Even the atmosphere was charming -- it's always nice to find the locals eating where you eat. We will go back! But all of our eating was not done on the road. Sometimes I even cook! A cold day of rain forced this food writer/food blogger to rethink our outdoor brick oven pizza night tradition and create a last minute substitution. I turned to my recently acquired NC bounty and mixed up a huge batch of Diana's Brunswick Stew, with the personal addition of one of my tubs of frozen barbecue. And what do you eat with Brunswick Stew -- Good Ol' Cast Iron Skillet Cornbread, made by an eastern NC native, with her own favorite cornmeal (and mine! ), fresh from North Carolina. I like knowing where my food comes from! The cornbread Dannie made in my kitchen last week is almost the same as cornbread made by my great-aunt and great-grandmother more than fifty years ago -- not too sweet, not too salty, not too fluffy, not too thin and not too thick. It was just right! I don't know where my family got their cornmeal way back then in Southern Illinios, but I know where I get mine. And I even know the delivery people! Read this charming blog post I found about the The Cornbread Man of Atkinson Mill in Selma, NC. And if you don't have friends who will deliver it in person, just order the full range of their products directly from the mill. *Note: I receive no free products, income or sponsorship from Atkinson Mill, and neither do my friends. Preheat oven to 425 degrees. Mix and sift dry ingredients. Add milk, egg and butter. Add shortening to cast iron skillet (large skillet for thin cornbread, small skillet for thicker cornbread) and place in oven to heat skillet and melt shortening. Carefully remove skillet and pour in cornbread batter. Return skillet to oven and bake for about 20 minutes, until top is golden brown. Serve warm. While having a few slices at one of our favorite pizza places here in STL, Dewey's, Kristen and I overheard a conversation taking place next to us. The young man, who had obviously discovered and greatly appreciated the local brewery of Anheuser-Busch, was telling Kirkwood residents all about the great state of North Carolina. Seems he attended Wake Forest and Carolina and had come from Charlotte to visit a friend on his way to Colorado. I had so much in common with him it was almost unbearable not to throw myself into the conversation. However, it was date night for us and I could tell one comment would lead to a lengthy conversation over many Bud products. While he preached about vinegar based barbeque and spending Summers on the Outer Banks, the Midwesterners sat on the edge of their seats, enthralled by his Southern charm and twang. He knew all the same places I began to miss and he defended them with the same vengence I do. I wanted to talk to him, but I didn't, it was date night. Sharing a great Italian meal on the Hill was a nice free meal with friends, but if you've ever had Wilbur's, Bojangles, or fresh seafood ever stripped away from you, there's nothing St. Louis will ever have to offer you that will come close to compare.... Except maybe those day-fresh Budweisers my friend from Charlotte had discovered! Love it! You're a good husband, Grant Sedlacek! Yes, there are many things for which NC is famous and make it a great place to live. BUT our visits to Carbondale yield us such bounty that we will continue to return. There are new recipes, fancy sauces not available in NC, wood fired pizzas, Italian beef hoagies, Honeybaker rolls, visits to many new and exciting places, and, of course, our time with Dean and Cora. There are no two better people to help you experience an area's culinary delights than these two. Sharing our love for great food is a wonderful part of a great friendship. We love to pour over each "Cora Cooks" for new and exciting recipes and ideas. Keep 'em coming, Cora! PS Cora is right - the particular brand of cornmeal is important and different from region to region. We find that our cornmeal is more finely ground in the South than in other areas. A trip down North Carolina's memory lane, compliments for my favorite son, and more compliments from recent houseguests! It's a good week for this food blogger. Loved hearing from all of you and I'm honored to have you all as family, friends and readers. Thanks!